Hearthside is a long-awaited project of Dominic and Lindsey Piperno. Dominic rose to local culinary prominence just a mile away, helping chef Joe Baldino open Zeppoli and working his way into kitchens in Philadelphia like Vernick Food and Drink and Kevin Sbraga’s—another South Jersey native—now-shuttered The Fat Ham. Piperno took his dream of an independent restaurant to the extreme, choosing a rare vacant lot on the bustling Haddon Avenue as his cornerstone. Flash-forward to a year later, and Hearthside opened its doors in September. The brand-new building boasts a look unlike any other in the area, thanks to skyhigh ceilings framed with geometric wood beams that also manage to trap sound and keep the room quiet. On one wall, you have floor-to-ceiling windows facing out to the main drag. Opposite of that stands the open, wood-fired kitchen, with bar seating for guests looking to catch a glimpse of the show. You can find both Pipernos darting through the restaurant on any evening, while Dominic’s right-hand man Aaron Gottesman—another Sbraga alumnus—helps manage the line. 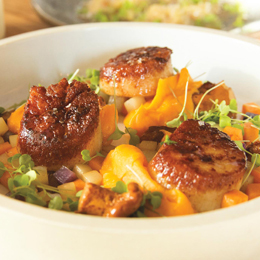 The wood-fired touch is unlike any menu in South Jersey, steering away from classics like sandwiches and pizzas in exchange for smoked plates, crisp and refined entrees and a large selection of shared dishes, made in portions for two or more. The meal started with a bowl of tuna tartare; diced, raw tuna served in an ice-cold stone bowl that preserved the freshness of the fish, finished with Asian pear, sesame seeds, fresh horseradish and a light sauce. The balance of the fish— which completely shined thanks to a clear attention to quality—against the mild sweetness and crispness of the pear formed a harmonious bite. A bowl of roasted beets came with a smear of pistachio butter then sprinkled with cherry granola. The juicy golden and red beets were earthy and soft, made less extreme by the fatty pistachio butter and the occasional sweet touch from the granola. Each element seemed to catch the other, making it so the flavors—which can be a bit unusual on their own—came together in a warm and seasonally fitting way. The menu features a selection of handcrafted pastas, seemingly mastered from Piperno’s Zeppoli days. Along with a bowl of handmade fusilli, brought to guests by Dominic by hand, we dove into pillows of smoked celery root agnolotti. Tissue-thin pasta was stuffed with creamy cheese and sautéed alongside diced celery, which had been smoked before being tossed in deep brown butter with toasted almonds. The smokiness alongside the developed brown butter brought agnolotti’s creamy cheese to life, and left me clamoring for the last drops of sauce in the bowl. The large plate of a grilled half chicken steered away from the smoke, instead serving the bird with a crispy exterior on a bed of creamy romesco. A mound of cipollini agro dolce—whole onions cooked in a vinegar-based sauce—sat alongside whole stem charred broccolini. The chicken was divinely tender and naturally juicy, and every flavor was relatively mild. It’s clear the goal of this dish was to highlight the ingredient with skilled execution. I found the scallops tended to stand alone alongside their accompaniments of sweet potato purée and a sautéed apple and chanterelle hash. The hash was creamy and sweet, and the mushrooms added a rich umami flavor that was mirrored in the plump day boat scallops, which were cooked to perfection with a phenomenal crispy brown sear and buttery finish. It’s hard to determine if the purée was a bit too sweet or if the scallops were just that good, but in hindsight it’s the shellfish that lingers in my memory as one of the evening’s highlights. You don’t always find restaurants that take dessert too seriously, but it seemed like every table was ending with something sweet, and I was not ready to be the exception. Deep-fried apple fritters are made to order and arrive as piping hot dough balls with a whiskey caramel sauce that packs a punch. Meanwhile, their carrot cake is stacked with flavor, drizzled in a less-boozy caramel and layered with marscapone that kept it creamy but not too sweet, a satisfying end to a satisfying evening. Nothing beats experience. Pick a field, trade or hobby and the fact still stands: practice always makes perfect. That fact is clearly illustrated in every nook and cranny of Hearthside. Piperno’s years of experience in the area have produced a restaurant space and menu that is truly unlike anything I’ve tasted in South Jersey in years. It’s relaxed but still refined and elevated without being stuffy or pretentious. I personally can’t wait to come back, and have been urging everyone I meet to make their reservations sooner rather than later.